THE DEVIL’S BUSINESS: Breaking Laws And Bending Genres – Schlockmania! If you’re going to crossbreed horror with another genre, the crime film is one of the best choices. It’s a surprise that it’s not done more often as this kind of crossbreed makes perfect sense: both genres deal in the dark side of life, feature the threat of violence around the corner and often depict the past coming back to haunt its characters. A recent film that grasps this duality is The Devil’s Business – and it manages to play the two genres against each other in ways that are often inventive. 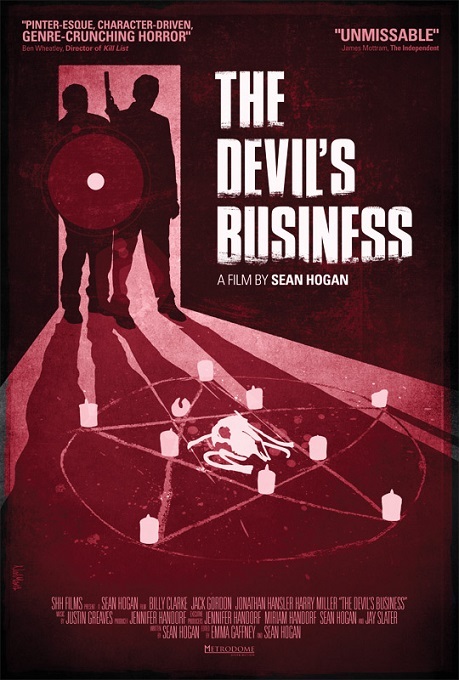 The Devil’s Business starts with a simple crime flick setup: two men are dispatched to break into a home and wait for its owner, who they have been instructed to kill. Pinner (Billy Clarke) is the veteran of the duo and he’s a bit annoyed with Cully (Jack Gordon), his wet-behind-the-ears partner on the job. Their target is Kist (Jonathan Hansler), a rival to their boss. Of course, this is no average hit: the house harbors some macabre surprises and the eventual meeting with Kist reveals this is no ordinary hit. The Devil’s Business is fun to watch because writer/director Sean Hogan knows both of the genres he’s working with quite well. In fact, the first thirty minutes plays like an old-fashioned British gangster flick and he’s clever enough to keep the horror elements subtle and just out of view for most of the running time. Nicola Marsh’s digital cinematography uses the story’s enforced low-lighting visual setups to atmospheric effects and Justin Greaves contributes a chilly, likeably subtle electronic music score. The film’s one notable flaw kicks in when Hogan overreaches for a slam-bang horror finale that’s out of step with the subtlety of what preceded it. That said, The Devil’s Business is a clever and engaging take on familiar genres overall (a big monologue Kist gets late in the film is particularly inspired). It’s also nice to see a modern horror film that invests heavily in characterization and dialogue over easy shock effects. The Devil’s Business also benefits from above-average performances for a low-budget horror item. Clarke, with his flinty stare and no-nonsense attitude, achieves an effortless gravitas as a criminal with some bad memories and Gordon makes a likeably goofy newbie to offset Clarke’s intensity. Hansler is also quite good in a small but potent role as the target: he carries some of the film’s biggest narrative concepts on his shoulders and does it with skill. In short, The Devil’s Business has some rough edges but wins out overall thanks to its novel approach to genre-blending. If you like both horror and crime fare, this is a fun bit of modestly-budgeted cleverness. 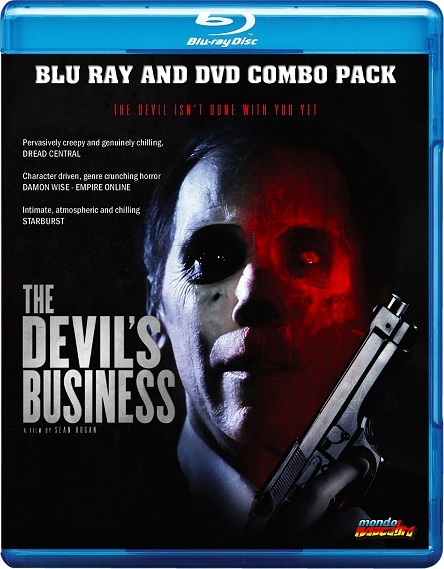 Blu-Ray Notes: The Devil’s Business was chosen as the second title for blu-ray release for Mondo Macabro, in a blu-ray/DVD combo set, and the results are impressive. The blu-ray’s transfer does well by the film’s mixture of nighttime shooting and primary-colored lighting and the DTS sound offers an appropriately rich soundscape. Extras include an EPK, music videos and interviews with the director, producer Jennifer Hansdorf, Clarke and, in a nice touch, composer Greaves. Like The Slave, it’s another quality blu-ray release for Mondo Macabro and will please the label’s fans.